Weather can be a big issue when it comes to outdoor entertainment. Building a tall roof or pergola over your outdoor kitchen will allow you to enjoy cooking outdoors, even in the extreme heat. 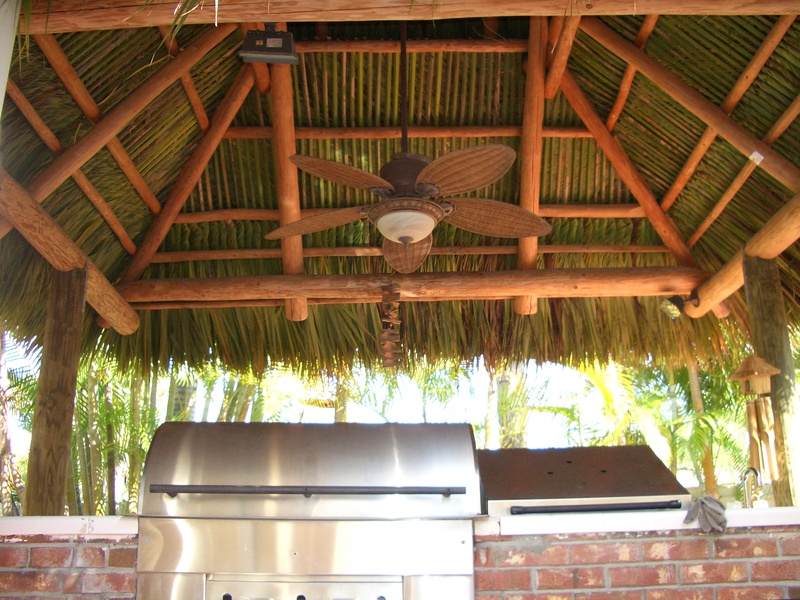 You can incorporate different forms of shelter such as having a Tiki Huts over your outdoor kitchen. Hot locations may want an overhead fan or mist sprays. Outdoor lighting will not only extend your time outside, it offers safety for walkways, staircases and grilling areas, and a nice touch for your outdoor kitchen tiki hut setup. Some outdoor kitchen designers incorporate lighting into the kitchen, either under the countertops or above. Pro tip: If you plan on installing an outdoor grill under a structure, be sure you allow plenty of clearance space between the grill and the ceiling, and design the room for ventilation. Dan the Tiki Man is one of the few Tiki hut builders capable of building a fire-retardant Tiki hut for commercial and residential use, such as a restaurant or hotel. Also, To prevent house fires, professionals never recommend operating a grill under eves or decks unless there is a professionally installed ventilation hood. Keep your grill clean to prevent accidental fires.